Russian bots were busy supporting Brexit in 2016, too. 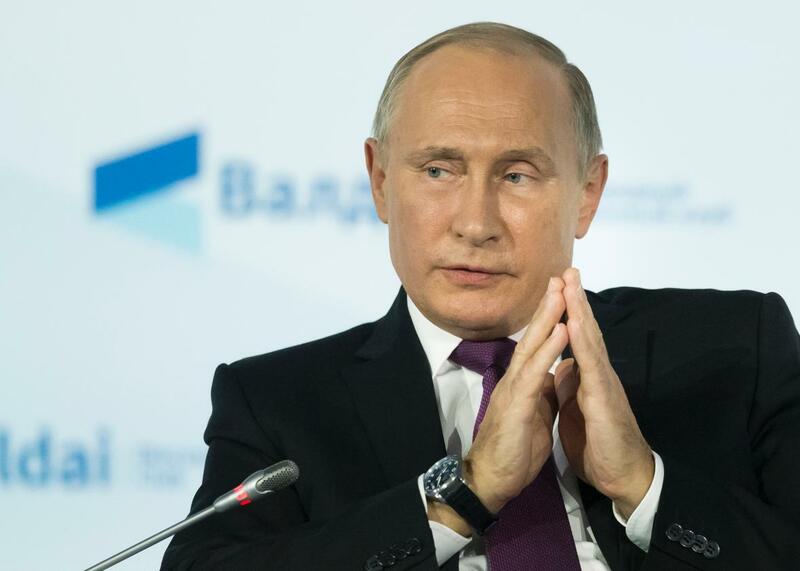 Russian President Vladimir Putin probably thinking about what he might tweet next. Russians agents sure do seem to love Twitter. Before and after the Brexit vote in June 2016, more than 156,000 bots and troll accounts that had Russian registered as their language were posting in English in support of the British departure from the European Union. According the New York Times’ report on a new study, those accounts tweeted about Brexit 45,000 times in the final 48 hours before the vote. A separate report from the Guardian on Tuesday detailed that 3,500 tweets with Brexit-related hashtags came from 419 of the 2,752 accounts Twitter identified to Congress as stemming from the Kremlin-supported Internet Research Agency. “These accounts were definitely using Brexit hashtags,” Laura Cram, a professor from the University of Edinburgh who co-authored the research on the Russian accounts shared with Congress, said in the New York Times. “But we cannot say whether they were primarily trying to influence Brexit or whether it was a side effect of them trying to wreak discord generally.” Seventy percent of these accounts were actually tweeting their Brexit content after the election. It is similar to what we’ve seen in the U.S., where bots and trolls continued to use their large social media following well after the 2016 election. After the alt-right rally in Charlottesville, for example, Russian-linked bots were tweeting divisive and counterfactual content that appeared tailored to deepen American political divisions. This news comes a day after the British government’s lead cybersecurity official, Ciaran Martin of the National Cyber Security Center, shared remarks accusing Russian hackers of attacking British energy, telecom, and media companies over the past 12 months. Again, this account is parallel to incidents in the U.S. earlier this year. In July, the Department of Homeland Security and the FBI found evidence that hackers had penetrated the networks of nuclear power plants, as well as computer networks critical to the U.S. energy sector. Those attacks uses similar techniques to those used by the Russian hacking group known as “Energetic Bear,” known for its ties to previous attacks on energy industry computer networks. Finally, the fact that Russian Twitter accounts were cheering for Brexit is also suspicious in light of Cambridge Analytica’s involvement with the Leave.EU campaign. Cambridge Analytica, which also worked for the Trump campaign, has been roped into the U.S. special investigation into Russian interference in the election. And the CEO of the company, Alexander Nix, reportedly reached out to WikiLeaks about Hilary Clinton-related emails while in contract negotiations to join the Trump campaign. U.S. intelligence officials believe WikiLeaks worked with Russian military intelligence to release stolen Clinton-related emails in 2016. Now it appears Russian agents and Cambridge Analytica were working in parallel during the U.S. 2016 presidential election and during Brexit. Still, just because Russian bots and Cambridge Analytica seemed to be rooting for the same teams at the same time and have some similar friends doesn’t mean that the two efforts were collaborating.